What's the biggest wow-factor you've ever experienced in PC gaming? The most jaw-dropping moment? For me, it was seeing 3D accelerated, tri-linear filtered graphics for the very first time. The game was Tomb Raider. The enabling hardware was an Nvidia Riva TNT2 graphcs chip. And if I remember correctly, the year was 1998, possibly 1999. Anyway, nothing since has had the same visceral impact. There have been dramatic moments, for sure. Getting my first 24-inch 1,920 by 1,200 LCD panel was pretty major. Seeing Far Cry running on the 16-pipe Nvidia Geforce 6800 Ultra sticks in the mind, too. But compared to that Tomb Raider moment, it's all been incremental steps. Is that because the big bang of hardware-accelerated graphics hasn't been matched by leaps of similar magnitudes since? Or is is just that, as an individual, one only really has mindspace for a single oh-my-god gaming event? I'm not sure, but that hasn't stopped me wondering when the next big wow might be coming from. It' not the new games consoles from Microsoft or Sony, of that i'm confident. 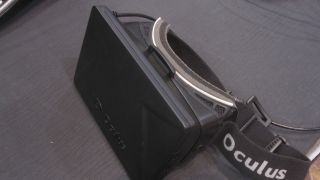 But could the Oculus Rift virtual reality headset be a candidate? The recent announcement that John Carmack of Doom fame and one of the great names in gaming innovation has been signed up as the outfit's Chief Technology Officer has got me pondering. Stereoscopic 3D all over again? Historically, I've always been pretty bah humbug about he whole virtual reality thing. But much like stereoscopic 3D, that's not because the basic notion is faulty. It's because the implementation was shoddy. In some ways, it still is. The developer or prototype kits of the Oculus Rift VR headset are pretty low-res (it works out to 640 by 800 pixels per eye, maybe a bit more depending on how you judge the overlap). Then there are problems with motion sickness. The experience is so real, it causes problems as your visual and physical experience doesn't matching up. It's a bit like 3D and headaches. Then there's the very notion of wearing a clumsy headset. Again, the comparison with silly 3D goggles pops up. And yet I can't quite shake the notion that we might soon wonder how anyone tolerated gaming before the Oculus Rift or something like it revolutonised the industry. How did we put up with those meagre flat-panel windows into our gaming worlds? Likewise, I've a feeling if it does catch on, there will be at least one or two killer non-gaming applications for the Oculus Rift that are as yet unknown. We're still several years away from knowing whether the Oculus Rift has legs. My feeling is that it will be version 2.0 with full-HD visuals and probably due out around 2015 that will be the real test of its viability. Yes, my enthusiasm is a bit speculative. But I'm excited about the possibilties in a way I'm not about any other gaming tech on the horizon.